Two Ford Motor Co. vehicles and two from General Motors Co. are on the short list of finalists for the 2010 North American Car and Truck of the Year awards. 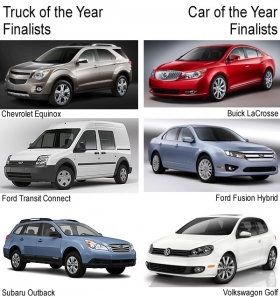 The car finalists are the Ford Fusion Hybrid, Buick LaCrosse and Volkswagen Golf. The Ford Transit Connect, Chevrolet Equinox and Subaru Outback round out the six vehicles to make it through the latest round of voting by 49 automotive journalists in the United States and Canada. The winners will be announced Jan. 11 at the Detroit auto show. Last year, the Hyundai Genesis won car of the year, and the Ford F-150 pickup was honored as the top truck. In the 16 previous years for the awards, U.S.-based automakers have won the car trophy eight times. European companies have won four times and Japanese three. Before last year's crown for Hyundai, no South Korean automaker had made the finals. In trucks, domestics have won 10 times, followed by four for Japanese makes and two for Europeans . Additionally, hybrids have won four times. More than 50 vehicles were considered this year; 16 cars and 10 trucks made the initial ballot. Automotive News is represented on the voting panel by Executive Editor Edward Lapham.